Buret, supplied with stopcock having PTFE plug, is graduated with a durable white scale from 0 to 1%, giving readings directly in percentage of acidity. 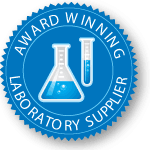 The complete outfit consists of one buret, filling tube assembly (glass tubes and rubber stopper), 100 ml beaker, rubber bulb, reservoir bottle, stirring rod, clamp and 9 mL pipet. The neutralizer and indicator must be purchased separately. Replacement Rubber Bulb (Item No. 3010-03) With two valves, control vent and four inches of tubing. Replacement Tygon® Tubing (Item No. 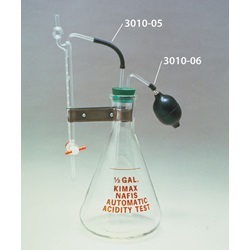 3010-05) For use with Acidity Tester. Per foot. Replacement Rubber Tubing (Item No. 3010-06) Pure gum, black latex. 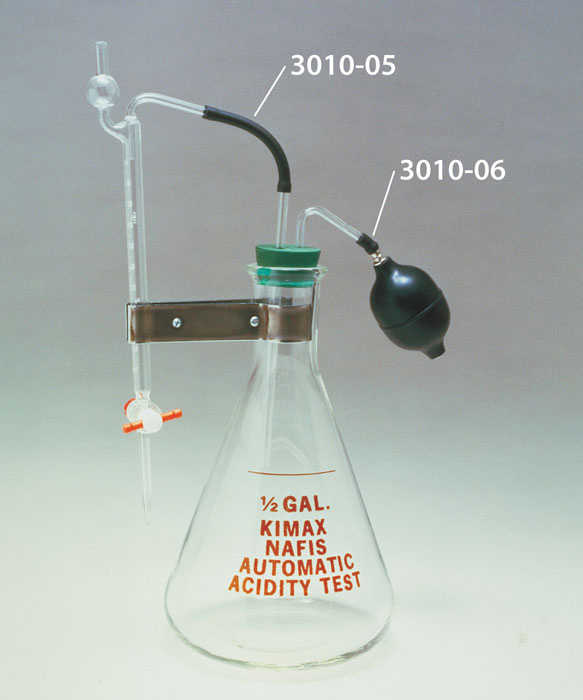 For use with Acidity Tester. Per foot. Replacement Tube Vent (Item No. 3010-09) Tube vent for Acidity Tester attaches to the rubber bulb. Replacement Stir Rod (Kimble 609-99) (Item No. 3010-04) Sealed, hollow stirring rod contains a paper comparator with two bands in different shades of pink, to aid in endpoint determination. Replacement Tube Filling (Item No. 3010-10) Long glass replacement tube for the Acidity Tester. Sign in to Buy 41 item(s) available to ship. 41 item(s) available to ship.